Today we are going to present you one really cool Android app that I'm sure you are going to like, especially if you are a girl and you like fashion and make up. The app Virtual Fit Showcase will enable you to have one pretty appealing virtual shopping. With this app you will never loose your shopping ideas, actually you will get much more interesting shopping designs and improve your shopping experience. They made sure that it is not only about fashion, there are furniture elements, sculptures and even jewelry. Thus, I'm sure you will have fun in combining different elements and even buying directly from the app. When you example select sofa, you can add sculptures to match your sofa. If you like certain product you can buy it directly from the app. That is why this is one of the best shopping tools available on Google Play. 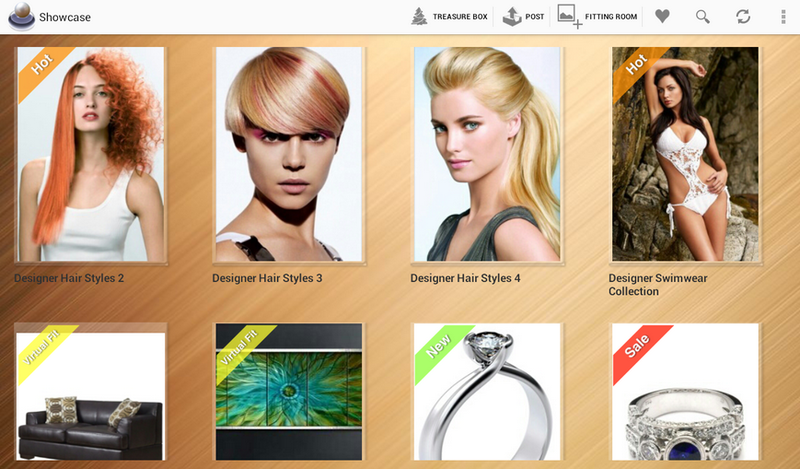 As for the fashion, there is really big selection of designer hair styles, dresses and earrings. You can combine them as well, to find the style that fits you the most. What is also great is that different producers can add their products as well. You can follow your favorite producer and get sales and catalogs from them. The app is very professionally and flawlessly designed by Cojomedia. This experienced group of developers have also worked on various other apps. I have to admit that they really created one polished, simple and fast app. The UI is very intuitive and easy to understand. If you want to find different shopping ideas, virtually arrange and combine products and directly buy products you like than you definitely need to try Virtual Fit Showcase. It is free and available on Google Play.